People living in one of Mozambique’s largest cities have been cut off by a huge storm. Cyclone Idai, which is carrying heavy rains and winds of up to 170 km/h (106 mph), made landfall at the port city of Beira on Thursday evening. “Houses and trees were destroyed and pylons downed,” the agency told AFP. The coastal town of Chinde, 400 km (250 miles) north-east of Beira was also badly hit, the INGC says. No deaths or injuries have been reported. 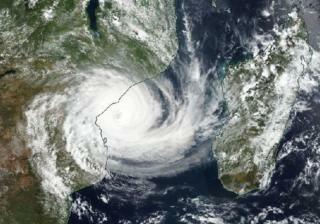 The cyclone is expected to move west to Malawi and Zimbabwe over the weekend. It follows a week of storms and heavy rains in in Mozambique and Malawi that have killed more than 100 people and destroyed thousands of homes. Beira is the fourth-largest city in Mozambique and its port sits on the mouth of the Pungwe river, that runs to Zimbabwe.